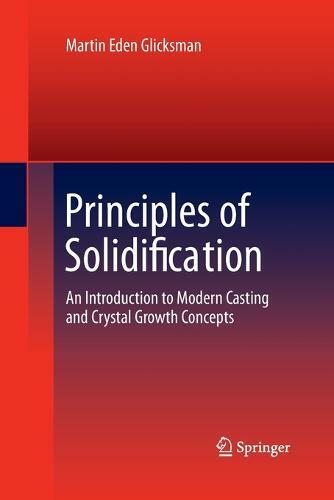 "Principles of Solidification" offers comprehensive descriptions of liquid-to-solid transitions encountered in shaped casting, welding, and non-biological bulk crystal growth processes. The book logically develops through careful presentation of relevant thermodynamic and kinetic theories and models of solidification occurring in a variety of materials. Major topics encompass the liquid-state, liquid-solid transformations, chemical macro- and microsegregation, purification by fractional crystallization and zone refining, solid-liquid interfaces, polyphase freezing, and rapid solidification processing. Solid-liquid interfaces are discussed quantitatively both as sharp and diffuse entities, with supporting differential geometric descriptions. The book offers: * Detailed mathematical examples throughout to guide readers * Applications of solidification and crystal growth methodologies for preparation and purification of metals, ceramics, polymers and semiconductors * Appendices providing supporting information on special topics covered in the chapters. Readers in materials, metallurgical, chemical, and mechanical engineering will find this to be a useful source on the subjects of solidification and crystal growth. Chemists, physicists, and geologists concerned with melting/freezing phenomena will also find much of value in this book.